Neo-Digital proudly presents: SolarFighter. Are you ready for the hardest fights in this solar system? You are not sure? Well, then try this great game and find out! SolarFighter is our new arcade style space shooter. In contrast to other games of this genre, it features highly intelligent opponents and realistic physics. This work is based on Solarwolf 1.5 written by Pete Shinners. It is open source and written in Python. The project is still at an early stage in development so we can present a first prototype only. It serves as a proof of concept of the artificial intelligence algorithm and allows us to try out several game concepts that we have in mind. We are going to exchange the graphics and sound effects subsequently by our owns. SolarFighter: this is the normal game mode that shares nothing except the game engine with Solarwolf. Please note that the gameplay is not completely defined yet. There are no seperate levels. As soon as you have killed all four opponents, four new opponents will be created. That's all for now in this mode. SolarFighter meets Solarwolf: in this game mode, you basically play Solarwolf, but the guards are replaced by the intelligent fighters from our new game SolarFighter and you have the same freedom of movement that you have in our game. 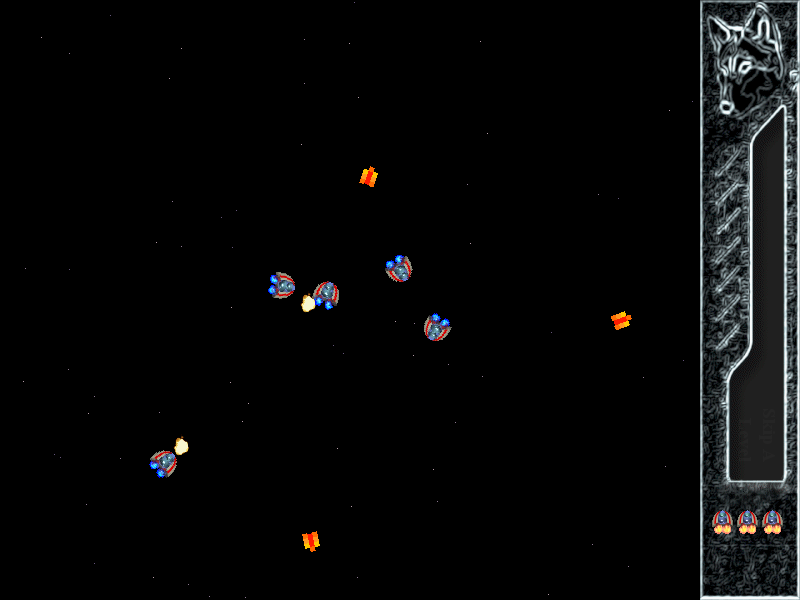 Solarwolf360: here you play the original Solarwolf, but you have the same freedom of movement as in SolarFighter and you can shoot the asteroids and the bullets of the guards. Please note that collisions between the ships are not detected in this version. We want to implement realistic physics like in a billards game and that takes some time. Use the arrow keys to control your ship like you would control a car in a racing simulation. Note that your velocity is not reduced by friction. Therefore, your velocity remains constant as long as you do not press "up" or "down". Press space bar to shoot. Adrian Posor is the project leader and developer of the artificial intelligence algorithm used in this game. Tim Polder is our graphical artist. His main task is to create new graphics for our game. So far, he has created the game logo. Wolfgang Röttger is our sound engineer. His task is to create new sound effects and music. This is a first official prototype only. Further development on this game will take place, but takes its time.